Today is Candlemas, now better known as “grounhog day” or “pancake day.” When I was a child, Candlemas, la Chandeleur, was a religious holiday that was also a festival of lights: la fête des lumières. We didn’t know it was groundhog day, nor did we know it was pancake day. We lived in the very Catholic province of Quebec, which was then a priest-ridden province and is now, otherwise ridden. However, times have changed. In Quebec, today is le jour de la marmotte and la fête des crêpes. Quebec has therefore caught up to the rest of the world. Apparently, Groundhog Day is a German tradition. (See Groundhog Day, Wikipedia.) Ironically , it could be that many Quebecers do not remember la Chandeleur, or Candlemas. We owe Candlemas to Pope Gelasius I who died in Rome on the 19 November c. 496 CE and is now a saint. Saint Gelasius wanted to replace Lupercalia, a disorderly pagan feast with a Christian feast, celebrated about 12 days later than 2 February. It was Candlemas, which eventually would take place on 2 February, according to the Gregorian calendar. Most Christian feasts are celebrated on the same day as a pagan feast and they inaugurate or close a season, the four seasons and liturgical seasons. Humans have also celebrated the day of the longest night, the winter Solstice, and the day of the longest day, the summer Solstice. They have also celebrated the days when day and night are the same length: equinoctial points, or an Equinox. This is the logic according to which Christian feasts are celebrated. It is a matter of season and one of continuity. Christmas is celebrated on 25 December, near the winter Solstice. Easter is a movable feast, near the spring Equinox, 27 April 2016. St John’s Day is celebrated on 24 June, near the summer Solstice. Michaelmas is celebrated on 29 September, near the fall Equinox. Easter is the only movable feast, but it occurs near the vernal equinox. 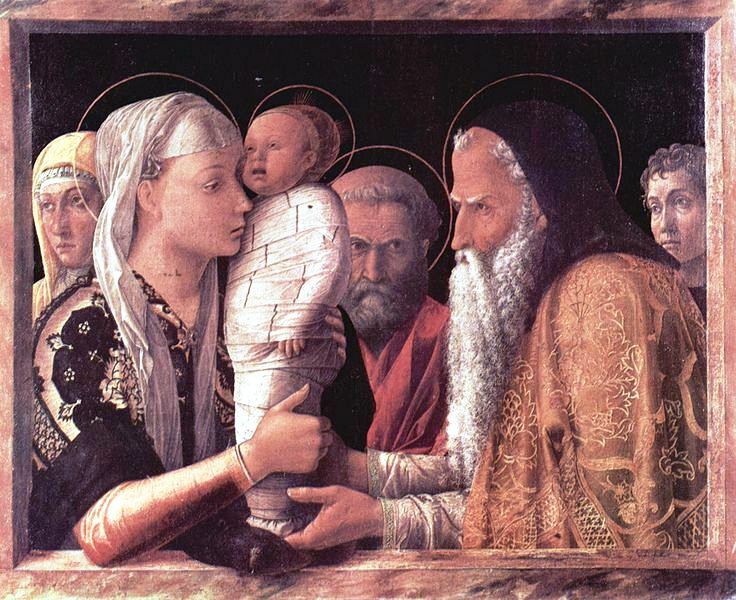 As for Candlemas, it is celebrated on 2 February and is a festival of lights or la Fête des lumières. It closes Epiphany Season and introduces a new Marian antiphon: Ave, Regina Cælorum, of which there are four. Moreover, it is the day when the canticle entitled Nunc Dimittis (Now let me leave) is sung. Antiphons are call and respond songs: a responsory, but canticles are songs of praise, such as the Magnificat. Beginning today the Marian antiphon is the Ave Regina Cælorum. It will last until Good Friday. There are equinoctial tides that occur near the time of an equinox. In France, they are called marées d’équinoxe. They were spectacular where I lived in Normandy. One could not see the water from the shore. When the water returned, it did rapidly. Sheep grazed on the prés salés (salted meadows), called présalés, at Mont-Saint-Michel. It could be that the tides brought the salt. Before or after walking to the Abbey, we would eat crêpes. There was a lovely restaurant at the foot of the hill. Sometimes we drove to Saint-Malô to eat crêpes. Tides occurring on solstices are less dramatic than equinoctial tides. The RELATED ARTICLES, listed below, will lead you to all relevant posts and songs. Today is February 3rd, but there are more Candlemas stories to tell. For instance, Candlemas is also “pancake feast,” la fête des crêpes, a tradition that goes back to ancient Greece. In ancient Greece, Lupercus was the god Pan. In ancient Roman, the feast was called Lupercalia (lupus, loup) but it was usually celebrated in mid-February, on the 13th. It had to do with keeping the wolf away from innocent sheep. Lupercus was the god of shepherds. I will tell more stories next February 2nd. I realize that fewer people go to a service on Sunday or attend Mass, but music and the fine arts have kept alive religious, mythological and mythical “reality.” Aert de Gelder (or Arent, 26 October 1645 – 27 August 1727), a student of Rembrandt, painted Simeon holding the child Jesus and, as noted above, Simeon sang the Nunc dimittis when he saw Jesus, as he had been told by none other than the Holy Ghost. (See Nunc Dimittis, Wikipedia). Religious feasts are usually associated with the seasons, mythologies give us a past, myths provide metaphors, and feed the imagination. Yet myths are the fruit of imagination. William Byrd (English Renaissance) composed a very fine “Nunc Dimittis.” It is featured in a post entitled: Nunc Dimittis, Simeon’s Song of Praise (2 February 2012). A second “Nunc Dimittis,” composed by Giovanni Pierluigi da Palestrina (3 February 1525 or 2 February 1526 – 2 February 1594), is featured in Candlemas: the Presentation of Jesus in the Temple & a Festival of Lights (2 February 2012). Palestrina is known for composing “transparent” polyphonic (many voices) music. Although the voices blend, one can still hear the text. This was important because the Reformed Churches favoured simple songs. I have found precious gems in the Church of England’s anthems. They engaged the faithful who were invited to sing. The English wrote lovely, melodious anthems. Martin Luther wrote hymns, the most famous of which is Ein’ feste Burg is unser Gott (A Mighty Fortress is our God). He could be right; women can be as nasty as men. I know, from personal experience, that women can in fact surpass men in cruelty, jealousy, hypocrisy, etc. They can be extremely manipulative, devious and vindictive. Think of my little blue house. (See From House to House.) My “case manager” was a woman employed by a fine insurance company. She did not lose her position. One day, a “good” woman posted the results of an examination on the door of her office, listing her students’ marks, not next to a number, but next to a name. I talked with her gently, but she did not know what I was talking about… However, a little later, such behaviour became an official violation. This may seem a detail, but good educators respect their students. That’s rule number one. Not that men are better. I am thinking of that student in India, raped and probably impaled to death. The poor young woman and her poor parents! And there is violence in the Middle East. Why? Also in the news is suicide. Young people are committing suicide! [i] or Cœlorum. The two are used. 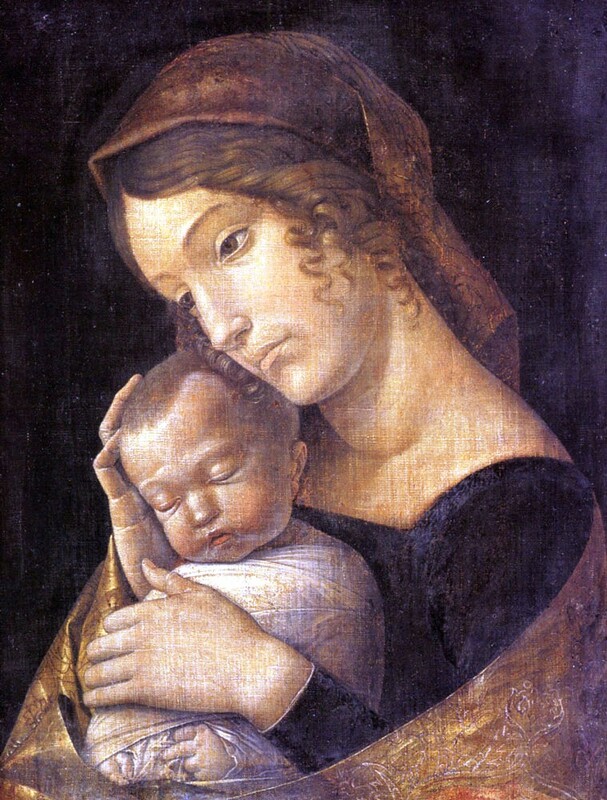 Andrea Mantegna was capable of crying.